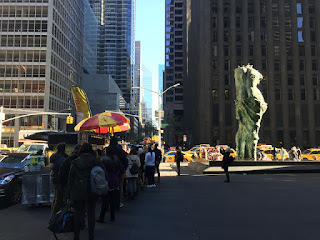 While well-known sightseeing stops fall with these boundaries, most notably Rockefeller Center, St. Patrick's Cathedral, and the great swath of famous Fifth Avenue stores, cultural visitors may also want to check out places such as the Austrian Cultural Forum, the 57th Street galleries, the Onassis Cultural Center, and the Municipal Art Society. 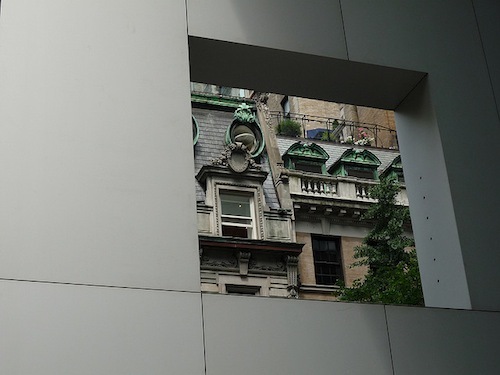 The image above shows an intriguing glimpse of the tops of two Beaux-Arts buildings through an opening of the wall inside MoMA's sculpture garden. These townhouses at 7 and 5 W. 54th Street are part of a longer row representing a time when millionaires lived in this part of Midtown. The building at 7 W. 54th dates from 1900 and was built for Philip Lehman of Lehman Brothers. 1. 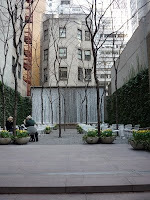 Paley Park, 3 E. 53rd St. This small urban park built in 1967 on the site of the former Stork Club is considered a model of successful public places. William S. Paley, the founder of CBS, donated the park and named it after his father. 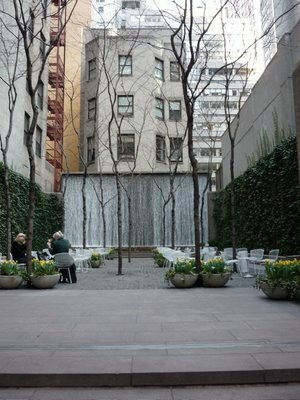 The waterfall at the back of the space, when turned on for the season, softens the noise of the street. A frequent gathering place for a sack lunch. 2. Austrian Cultural Forum, 11 E. 52nd St.
Before entering, please step back to look at the acclaimed architecture of this 2002 building. Architectural theorist and practitioner Raimund Abraham designed the slender 24-story building on E. 52nd Street, built in 2000. 3. King Cole Bar, St. Regis Hotel, 2 E. 55th St.
Order the signature Red Snapper at the King Cole Bar inside the St. Regis Hotel. Enjoy Maxfield Parrish's Old King Cole, the delightful mural stretching behind the bar. 4. Henry Bendel, 712 5th Avenue. The roots of Henri Bendel rest not in Paris but in French Louisiana, but as a famous designer and retailer, Bendel would cultivate Parisian connections. Speaking French greatly helped his cause. According to all reports, Bendel maintained a personal connection to the citizens of his native Lafayette, Louisiana throughout his life. While here, be prepared for running the gamut of perfume representatives. 5. 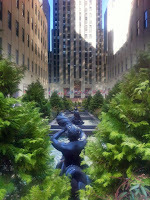 Rockefeller Center, 48 to 51st Street, from Fifth to 6th Avenue. Architect Raymond Hood, as head of the design team, bore the main responsibility for negotiating among the many interests to make "the City within a City" a reality in limestone. 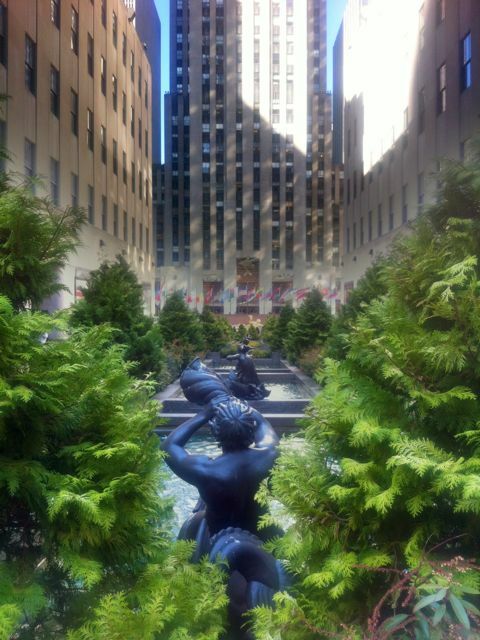 While speaking the language of cost and efficiency, he argued that Rockefeller Center needed roof gardens, open spaces, and works of great art if it was going to succeed. Almost everyone else at the time thought it was going to fail. They were wrong. 6. Paris Theatre, 4 W. 58th St.
See a movie here for a charming experience. The Pathé Company opened this arthouse cinema on September 13, 1948. The company owned the theater until 1990. 7. Carnegie Hall, 881 7th Ave. 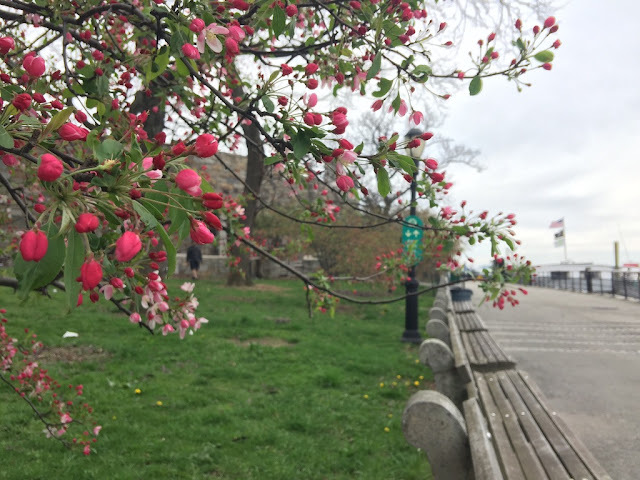 The great 57th Street cultural corridor began in 1891 with the opening of Carnegie Hall, the symbol of music world success. A year later, the Art Students League moved into the new American Fine Arts Building, an elegant French Renaissance building at 215 West 57th Street. 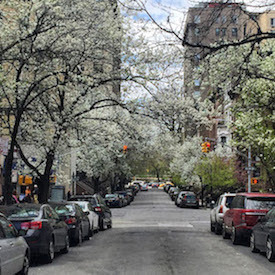 Developing by small increments, by the late 1920s the blocks of West 57th Street between 8th Avenue and 5th Avenue had become a major center for cultural life in the United States. Look for public artworks near MoMA by notable contemporary artists, including Robert Indiana's "LOVE" and Jim Dine's "Looking Toward the Avenue." In addition to MoMA, visit the contemporary galleries along 57th Street, including Marian Goodman, Marlborough, and Laurence Miller. 10. Sony Wonder Technology Lab, 550 Madison Ave.
An interactive museum highlights the visual culture of the high tech age. 11. Halal Guys, corner Sixth Avenue and W. 53rd St.
At the corner of Sixth Avenue and W. 53rd St in Midtown Manhattan, the Halal Guys dish out gyros, sandwiches, and platters to a steady line of patrons. They have two carts set up on either side of the street. 12. St. Patrick's Cathedral, 14 E 51st St.
Olympic Place explicitly asserts a connection to classical Greece as it serves as the home to the Onassis Cultural Center. The newly renovated center (see related story) features galleries with free admission and is open to the public Monday through Saturday 10:00 a.m. to 6:00 p.m.
14. Paley Center for Media, 25 W. 52nd St.
Revel in the history of television, radio, and emerging media. The Paley Center frequently gathers the casts of popular TV shows to talk about their programs. The 1952 building is famous for introducing the world to the glass curtain wall, and while some may hate them for their evil spawn, the building has aged well. 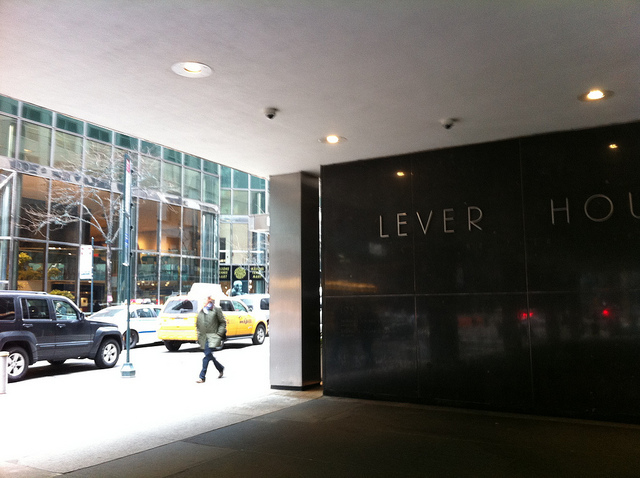 The Lever House Art Collection displays works of art in the building's courtyard and adjacent spaces. 16. St. Thomas Church Fifth Avenue, 1 W. 53rd St. The Episcopalian "high church" features stunning Gothic architecture and a world-famous music program. 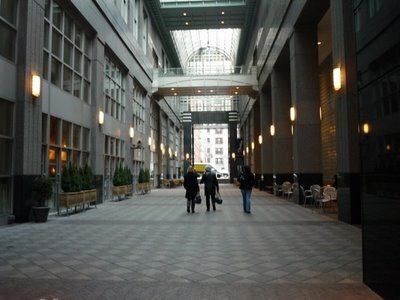 Edward Larrabee Barnes designed the tall wedge-shaped office building to accommodate a ground level open space atrium. Enjoy the indoor bamboo trees while grabbing a drink and a snack. 18. Saks Fifth Avenue, 611 Fifth Ave. The flagship Saks store on Fifth Avenue, directly across the street from Rockefeller Center built a decade later, won many accolades upon its opening in 1924. The store was one of the first to seriously use elaborate window displays as a form of merchandising. Later renovations included the installation of escalators and the construction of a commercial tower. 19. Explore the midtown arcades. 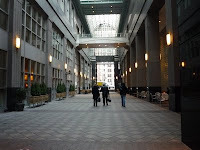 This area of Midtown, around the hotels and places in the Theatre District, between 6th Avenue and 8th Avenue, features several walking arcades. Just to the east of 7th Avenue, four arcades run north and south linking W. 51st and W. 55th. Food: Midtown Manhattan features not only landmark places to shop and explore but also some stellar dining opportunities. Many additions could be made to the list below. 20. Petrossian, 182 W. 58th St.
On the ground floor of the ornate Alwyn Court Building, enjoy caviar and French-inspired food in a spectacular room decorated with Lalique glass and Limoges china. Dress up. 21. 21 Club, 21 W. 51st St. This clubby historic New York spot for cocktails will make you feel like you're in a New York movie. Good spot for the horse set. Drink a Manhattan, by all means. Note: The famous deli is scheduled to close by the end of the year. Wear comfortable clothing and shoes, so you can walk off absurd portions of pastrami sandwiches and slices of cheesecake. 23. 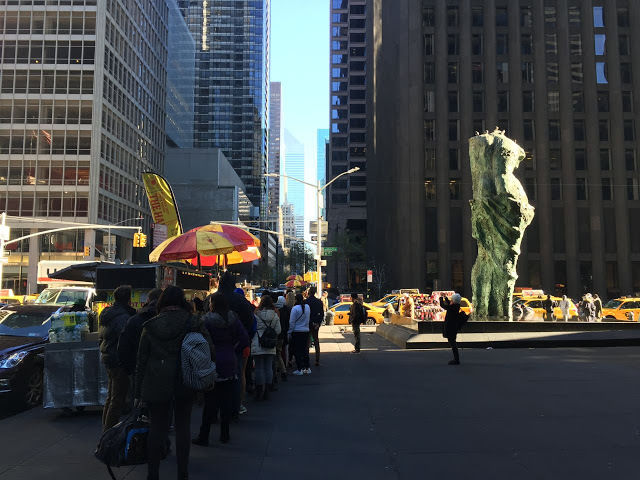 Burger Joint at Le Parker Meridian, 119 W. 56th St.
Line up for one of the best burgers in the city. A simple hamburger-centric menu with drink choices of water, milkshake, wine, and beer. You may order a brownie for dessert. 24. Radiance Tea House and Books, 158 W. 55th St.
Extensive selection of teas in a calm, serene atmosphere. A welcome respite from busy Midtown streets. 25. Bar American, 152 W 52nd St.
Brasserie by Bobby Flay offers reliable regional-inspired fare including smoked chicken pot pie, shrimp and grits, and grilled pizza with bacon.